“The boom years are over” say analysts, as delegates meet at the 2nd Asia Pacific Ireland Business Forum at Croke Park in Dublin today. CHINA’S ECONOMY GREW at its slowest rate in three years in the second quarter according to the country’s National Bureau of Statistics, adding to fears that the world’s second largest economy will not be able to offset the economic slowdown in much of the rest of the world. The country’s GDP grew at an annual rate of 7.6 per cent between April and June, down from 9.5 per cent a year earlier, according to the figures released this morning. China has grown by an average rate of about 10 per cent for the last decade, becoming one of the world’s largest consumers of luxury goods items and prompting many governments, including Ireland’s, to look to it for exports. Today, delegates are attending the 2nd Asia Pacific Ireland Business Forum at Croke Park in Dublin. 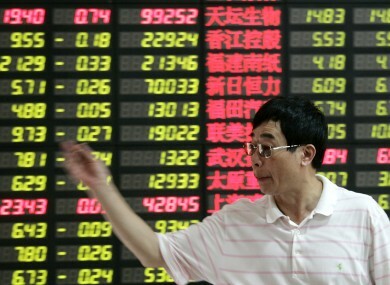 Email “China's economy slows sharply”. Feedback on “China's economy slows sharply”.